Brooks, Steve and Finn have begun their fall campaign. Here, they display a take of ducks. Fall is a holy time of year for the Reynolds family. Steve, Brooks and Finn — and soon, we hope, Thomas — take to the waters of the Adirondacks for bird shooting. In a recent dispatch, Steve shared the details of a spectacular duck shoot with longtime friend Chris Williamson of Jones Outfitters. 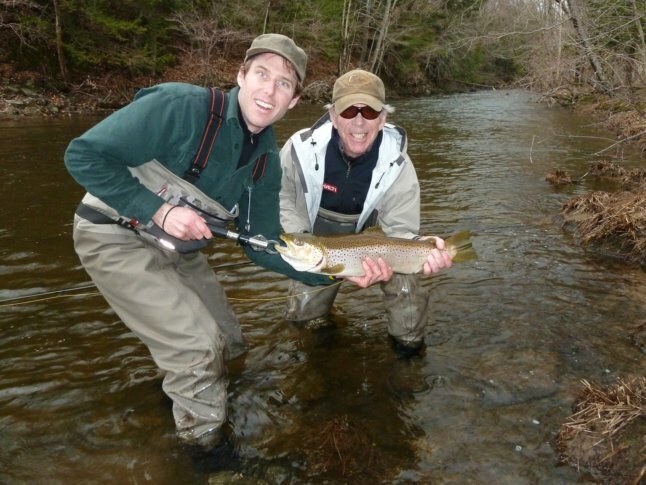 ejforbes.com Outdoor Correspondent Steve Reynolds poses with his father and a brown on Tuesday in the Salmon River near Pulaski, New York. I had a pleasant surprise just a few hours ago when Outdoor Correspondent Steve Reynolds ended a drought of correspondence about his exploits with a some photos and a note. Winter still lingers in the Adirondacks, but fishing is under way. Reynolds and his father, J.D., set out for the Salmon River in search of steelheads on Tuesday. It’s an annual ritual, as we’ve noted before. Conditions were fantastic, Steve reports, though the river was rushing at about 750 cubic feet per second. The water’s temperature hovered at a balmy 38 degrees. With the Reynolds was Walt Geryk, a guide who is a leading guide along the Salmon. 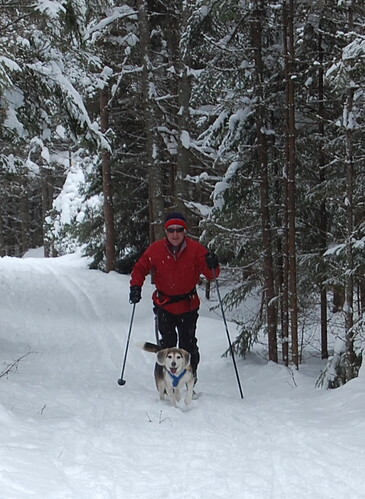 Your writer and his hound, Kennedy, give skijoring a go a few miles from Saranac Lake on Sunday morning. It’s something I’ve always wanted to do. And in all the years I lived in the Adirondacks, I never gave it a go. Skijoring, in which a nordic skier is pulled by a dog or horse, is not something I ever thought my hound, Kennedy, could handle. While he is a very fast runner, he’s led by his nose and he only weighs 35 pounds. But on Sunday, during a visit to Camp Mary, aka Mount Van Hann, a property outside Saranac Lake owned by our dear friends Molly and Steve Hann, we gave it a try. Ken was up for the challenge. Despite initially trying to play with Lola, the Hann’s English Setter, he eventually got the concept, if not the practice. That nose distracted him quite a few times. He was, after all, at home in his native Adirondacks and he loves to dive into deep snow piles. By the time Steve yielded the harness to me, though, Ken had basically hit a stride, albeit a slow one as he was tiring out — 45 minutes of dashing around with a snowshoed Mrs. F. diminished his strength. As you can see in the gallery below, the Hanns have developed a nice little network of loops. Steve, ever the man for a project, has purchased a 1979 SkiDoo Alpine and built a groomer. They’ve got a kilometer and a half of trail in total, all cleared and well marked. Brooks Reynolds and Finn display some of their take Sunday morning along Lake Champlain. The Reynolds clan continued their fall bird-shooting campaign on Sunday, taking in an outing to a pocket of water near Lake Champlain. Steve, our country sports correspondent, his wife, Brooks, an accomplished outdoorswoman herself, and their mascot, Finn, braved 13 degree temperatures and snowy conditions for the hunt. Their take of mallards was a trio of drakes and a hen. Finn makes a retrieval from Ed Forbes on Vimeo. Brooks Reynolds displays a 20-pound grouper she landed off North Carolina. The Reynolds clan dispatched a report this morning from North Carolina, where they’re spending the holiday. 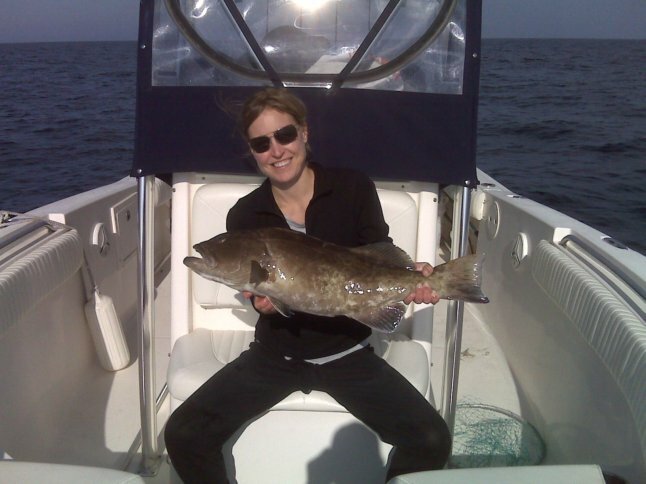 Taking a break from their fall hunting campaign, our outdoor correspondent and his wife took to the Atlantic to pursue their other sporting passion: fishing. In addition to their real estate and concierge businesses, the Reynolds are also accomplished hunting and fishing guides. Indeed, before their marriage, they spent parts of their years in the south working as fishing guides. Brooks Reynolds — a native Tar heel — landed a 20-pound Grouper about 20 miles off the North Carolina coast. Steve reports that the take also included some sea bass. Hope they keep fishing all week long. 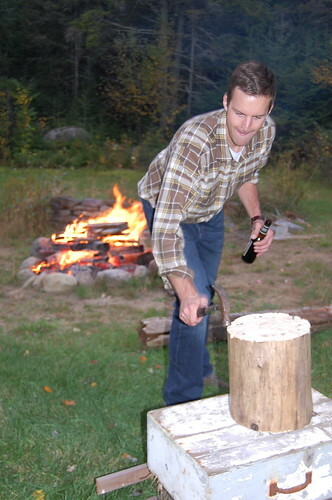 Our good friend Doug strives home a nail during a recent game of Stump in the North Elba woods. We dropped the hammer, literally. A few Saturdays ago deep in the North Elba woods, a group of Mrs. F’s closest St. Lawrence friends and I were slamming away at nails embedded on a sturdy New Hampshire stump. A bonfire blazed beside us. We were warmed by fellowship and a few cases of Saranac. We were playing Stump, a game said to originate in the Granite State, home of our generous hostess Cate, who’d arranged for us to spend the weekend at a farm owned by some very good friends. The rules of engagement are simple: Procure a decent hammer, some high-grade nails and a stump. Gather round — the game can be played by as few as two — and start hammering. But not before tossing the hammer 360 degrees and catching it. Doing so once allows you to deliver an opponent’s nail one swift strike that immediately follows the toss. It is critical, I learned, that this all be done at once. A toss around the back or under the leg warrants a second strike. Each time your nail is struck, you naturally take a sip of your cocktail. If a spark is created by a strike, everyone drinks. Hilarity generally ensues. Your writer, whose 1980s childhood was spent sans Nintendo, doesn’t have the best hand-eye coordination all the time, but still fared decently. So too, did Mrs. F. Granite State Cate, a fine horsewoman and an excellent writer, is also a Stump ringer. She went down to the wire with our good friend Doug, who, in addition to being inches from finishing medical school, was an ace rower during his Canton campaign. Gallons of Saranac were consumed; hilarity ensued. Finn Reynolds brings in a retrieval. from Ed Forbes on Vimeo. Andrew Weibrecht, a bronze medalist in the men’s super-g at the 2010 Olympic Winter Games in Vancouver, poses last week with Finn Reynolds and some take harvested along the south end of Lake Champlain. Lake Placid native Andrew Weibrecht is a good friend, a world-class alpine skier and an Olympic bronze medalist. The Warhorse is also a pretty good shot. Braving steamy temperatures that broached the low 70s, Weibrecht joined outdoor correspondent Steve Reynolds for a Wednesday morning shoot on lower Lake Champlain. Finn Reynolds, our retrieving mascot, was also along for the trip. A swampy landscape and the weather made for a challenge all around. The steam can be seen on the image above. “This terrain can break dogs with years of experience,” Reynolds said. “It was very out of the way. 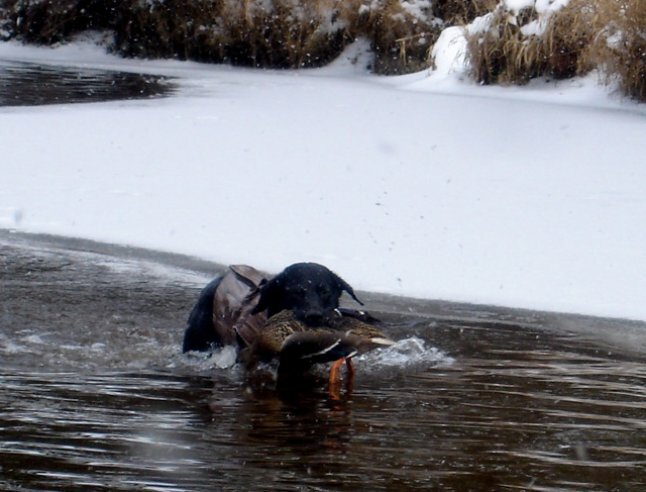 We had brutal hunting — it was really tough for the dog to mark but he had some excellent blind retrieves. He rose to the challenge. The quarry yielded included 4 wood ducks and a Drake mallard. Aside from their obvious Lake Placid ties, Reynolds and Weibrecht have deep connections through their alma mater, the Northwood School, and the New York Ski Education Foundation. 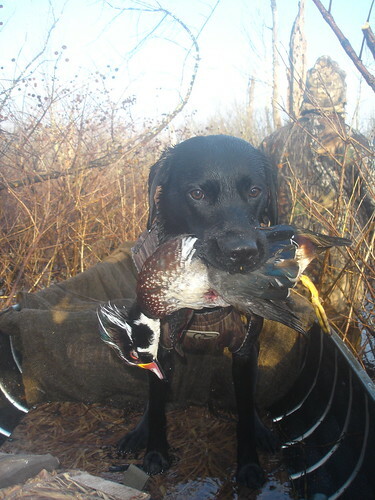 Finn displays a retrieved woodie. Brooks Reynolds and Finn, the northern hunter, display a take. The Reynolds clan always has a busy fall. 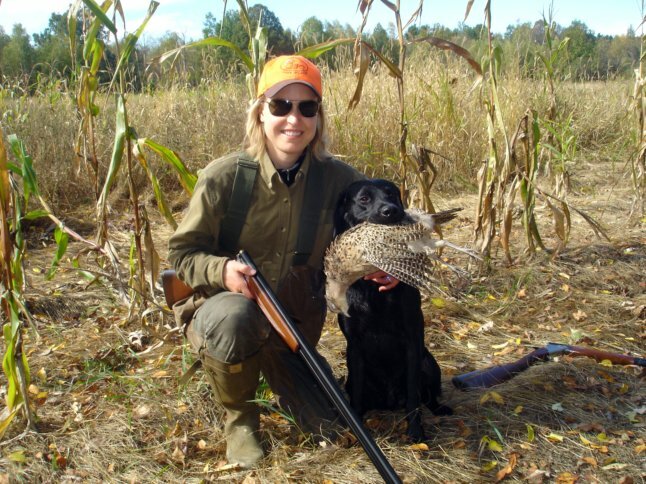 Bird-shooting is an essential family activity and the North Country proves a perfect playground. Last week, Steve, Brooks and Finn joined with good friends and fellow shooting enthusiasts Dan Harrigan and Werner Spitz for a trip to St. Lawrence County, where the bounty included green- and blue-winged teals, pintails wood ducks and pheasants. Steve reports a total of eight pheasants were taken. Accommodations were made at the charming Whistler’s Inn in Rensselaer Falls. Operated by sportsmen Zach and Jennifer Benson, the Inn makes its home in an 1872 farmhouse and is named for the Goldeneye. The Bensons, Steve reports, are accomplished guides and, in addition, Zach Benson is a terrific decoy carver. Details on both pursuits are available on the Inn’s web site. 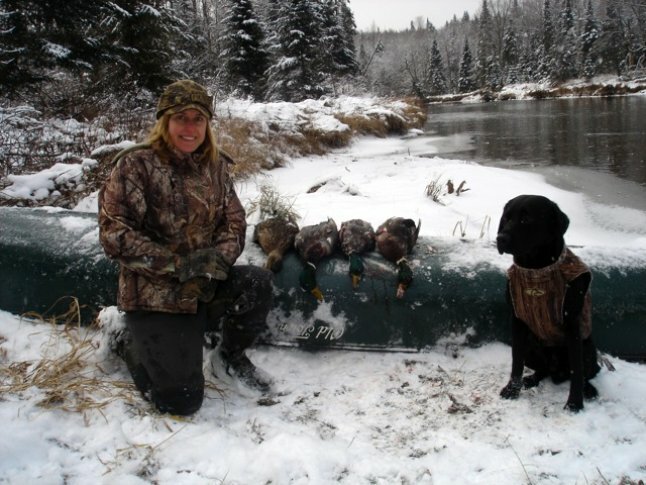 Brooks Reynolds displays some wood ducks she took with Finn, her Labrador retriever, and her husband, Steve. The Reynolds clan of Brooks, Steve and Finn — young Thomas wasn’t along for the ride — had a nice outing near Potsdam Sunday, Steve, our outdoor correspondent reports. 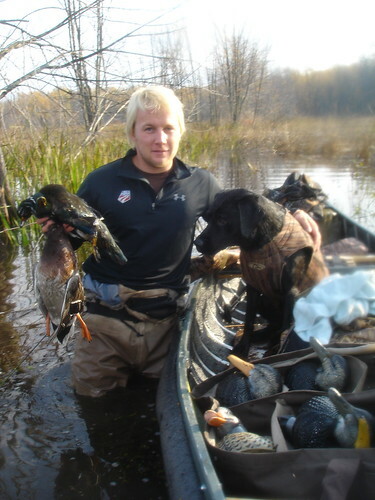 The trio bagged eight wood ducks with a friend they’ve gotten to know through their involvement with Ducks Unlimited. 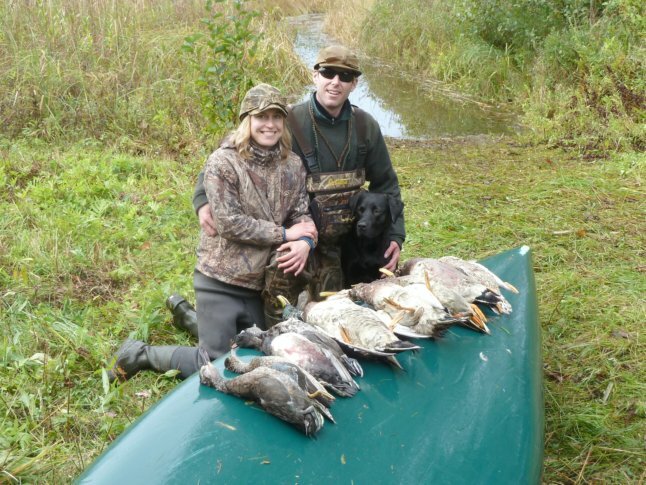 The hunt took them to a marsh near Potsdam, N.Y.